There was a change of pace from the images of oBikes being fished from the Yarra or rescued from unsuspecting trees when the Yarra, Port Phillip and Melbourne councils worked with oBike to enforce new rules this week. These rules make sense: the bikes can’t block footpaths, must be parked upright and extra staff working to within the areas. However it’s not a problem isolated to Melbourne. In China, where there’s 16 million shared bikes, there’s thousands stolen, vandalised and dismantled so parts can be sold. In San Francisco, similar acts of vandalism were linked in some part to fears over gentrification. Singapore, where the company started, minimal issues which raises the interesting point – is it brand or culture that’s keeping bike sharing services in the papers? It’s a much spoken about truth that it’s the consumer not the company that owns the brand, regardless of the category. These are the people who have an attachment to the product or service, choose to buy it over others, eat, drink, bathe or live with it. It serves a distinct purpose to them. Whether it’s a functional or emotional attachment, it’s the consumer that defines the relationship they have with a brand. In the shared economy world, is there an attachment to the oBike or other bike sharing brands? 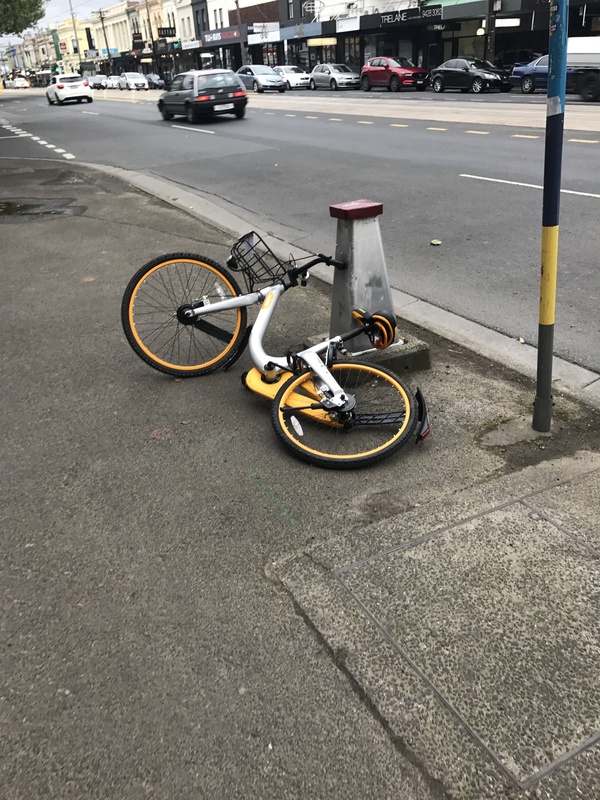 While your lycra loving cyclist might not be the target audience for oBike, you would doubt they treat their bikes the same way that select oBike customers are. These people are the ones who have done their research, saved their money, invested and bought their own bike and as such, treat it with care. There’s a bond which brings respect. But what if we look to other shared economy brands? Is the reason we’re not seeing spare Uber parts being sold on Gumtree driven from our need to have a high rating? Are we frantically cleaning our AirBnB houses before living to avoid a negative review from the host? oBike works on a credit points system designed to encourage positive behaviours and reprimand the negative ones. With this in mind, is culture the issue and the Melbourne public relationship with the brand and not the oBike user? While I’ve visited Singapore Airport on multiple occasions, I’ve yet to visit the country but well aware I would need to dispose of chewing gum appropriately to avoid a fine. This brings connotations of cleanliness, courteous and respectfulness so the lack of damage to bike sharing services intuitively makes sense. If I think about Melbourne, which I know infinitely better, I start to struggle with identifying our consistent values. Yes, people externally view us as the world’s most liveable city but what about the people within. Perhaps it’s our contradictions that define us. Hardworking yet laidback. See ourselves as unique while consistently wearing Melbourne black. Four seasons in one day. Pride ourselves on mateship but not migrants. Divided in decisions about yes versus no. Perhaps it’s the contradictions that yet to embrace the bike sharing brand – a city divided on the benefit: seeing clutter and congestions before exercise and environment. A city selective in its willingness to embrace new ways and cautious of challenges to the status quo. A population protective of its own possessions but wary of playing with strangers’ toys. Regardless, the oBike brand and sentiment towards is at present being owned by the people not using the service and the challenge is to change the narrative. Think about the benefit – not to the user, but to the average Melbournian … how and why is oBike going to make a difference to their lives. Then think about the personality … how can the oBike brand personality be matched or like our actual self or ideal self. Liveability gives us social currency, we pride ourselves of living within and amongst culture, we’re sports obsessed … surely there’s a connection with a bike somewhere in that.